Outdoor carpeting can make a worn-out porch look like new. It can be laid on patios and on steps. The key to laying the carpet is to know where to begin and the tools to use. There are a few simple steps that will make the job easier, with less mess. The surface that you are laying the carpet on needs to be clean and free from debris. The surface should also be smooth. If you have a rough, pitted surface, use an orbital sander with 60-grit sandpaper to smooth the surface. Patch holes with Quickrete, and allow to dry overnight. Outdoors you can use a garden hose to rinse the entire surface. After the surface has dried, use a broom to sweep away any residue. A clean surface will provide good adhesion. Measure the length and the width of your surface with a tape measure. Add extra if the carpet will wrap over any edges. Multiply the length and the width together. This will give you the square footage of carpeting that you need. You may need more than one roll. This depends on how wide your porch is. Carpeting typically comes in 12-foot wide rolls. You can have the carpet cut the width that you need at the place of purchase. The easiest method for spreading glue is to use a straw whisk broom. The broom will provide the same coverage that a trowel does but with a lot less mess. Dip the broom into the exterior carpet glue. Begin spreading the glue nearest the back wall of the porch. Spread the glue approximately 2 feet out from the wall and all the way across the entire width of the porch. If you spread the glue too far, you will not be able to set the carpet in place without walking in it. Tip: You can walk on your carpet the same day that it is laid, but it is best if it does not get wet for at least a week. This allows the glue plenty of time to dry. Lay the edge of the rolled-up carpet to the bottom edge of the wall. Roll the carpet only out as far as you have spread the glue. Smooth the carpet over the glue with your hands. Continue this process until you have covered the entire surface. 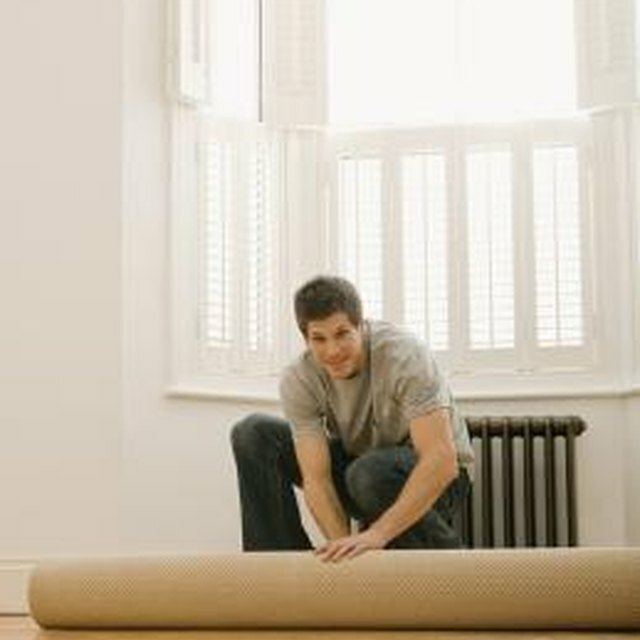 It is easier to work with rolled carpeting if you leave it rolled up and unroll it as you are laying it. You need a box knife and extra blades to cut the carpet. It is important to change your blade often. Cutting carpet dulls blades quickly. You should not have to struggle to cut the outdoor carpet. To cut carpet at the edge of a porch, hold the carpet tight against the edge. Allow the box knife to rest against the edge of the porch as you are cutting the carpet. This will give you a straight cut. Trimming and fitting carpet is a lot like trimming and fitting wallpaper. If you plan to lay carpet on porch steps, make sure that you add enough carpet to the square footage when you purchase it. Measure the width and length of each step, and also measure the height. Spread your glue on each step only as far as you can reach. Roll the carpet onto each glued step and smooth with your hand. Complete for each step. Use a sharp blade to trim off the excess on each side of the steps. Hold the side of the carpet tight to the edge of the step. Allow your blade to rest against the side of the step as you trim off the excess. For outdoor carpeting, I have found the it is best to use glue. Glue covers the entire surface; tape is mainly used on edges and at seams. Carpet glue will withstand weather better than tape will. Carpet tape is best used on indoor patios or closed-in porches where weather is not a factor. Carpet glue is also designed to adhere well to concrete for a very long period of time. Usually you will find that your carpet will wear out before the glue does. Carpet squares are an easy way for people to be able to lay their own outdoor carpeting. You will need to measure your square footage the same as you do for rolled carpet. This will tell you how many squares that you need. For outdoor patios and porches, it is still best to use carpet glue. Spread your glue as far as you can reach, and then simply lay the squares. All you need to do is make sure that you set them tightly together. For steps, you can cut the squares to fit, but most are too thick to wrap over the edge of a step. In this case you can purchase a small roll of carpet to match the squares and use that for the steps. To cut your carpet around a post, first find a helper. When you get to the post with your carpet, Unroll the carpet up the post. Have your helper hold it in place. Cut the carpet with your box knife approximately where the center of the post is. Cut the carpet from the base of the post all the way to the end where your helper is holding it. After you have cut the carpet, it will wrap around both sides of the post and seam back together. For many, this is easier than trying to precut the post positions before ever laying the carpet. What Can I Do About Slippery Tile Stairs?